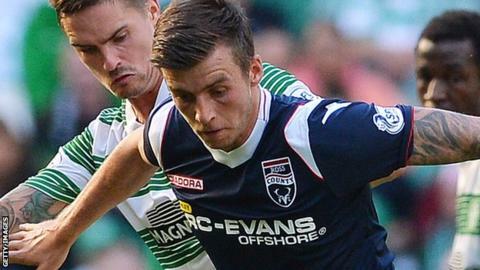 New Plymouth Argyle signing Graham Carey says the League Two club's fans can expect a more entertaining brand of football under new boss Derek Adams. Midfielder Carey, who played under Adams at Ross County, was one of the new manager's first new additions when he took over at Home Park. "The manager encourages all the players to get on the ball and express themselves," he told BBC Sport. "There's a lot of players in the squad that will do that and entertain." And the former Celtic youngster, who has also spent time at St Mirren and Huddersfield Town, says Adams will prove popular with his team-mates. "He's quite meticulous in the way he does it, he's quite organised and I don't think that'll change," continued Carey. "It'll be enjoyable for a lot of the lads to work with him, because even in training he wants to get the ball down and play. We'll be working hard, but we'll be doing it with the football. "He's an honest guy and he'll say it how it is. If you're not working hard enough he'll say it, and if you're doing well he'll also say it."